On Sunday, the Mt. Hood area got another 4 inches of snow and we headed up with our snowshoes to hit the trails. ODOT was requiring chains or traction devices, which brought trafffic to a standstill as people were pulling out to put on chains. Les Schwab has already put on our snow tires for the year, and the all wheel drive of our Suburu gets us up the mountain nicely. The long delay in traffic slowed our plans so we stopped at the Snow Bunny recreation area which is one of the first good trail heads past Timberline. From there, we headed north on the Snow Bunny trail, then east on the Yellowjacket trail, and then back south to the parking area using the Whiteaway trail. 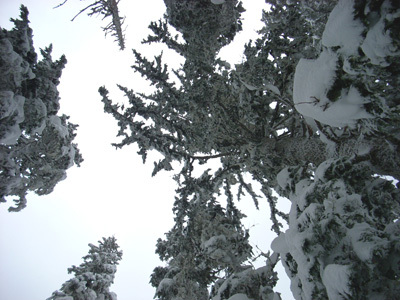 It snowed for much of the trek but once we got into the trees then winds calmed. For much of the yellowjacket, and all the Whiteaway trail, there had been no one on the trail for a day or so, which allowed us to break trail through fresh snow. I am guessing the base there is about 100 inches, and in the airy snow I was often sinking 12 inches. Shoeing in powder is a little more effort than the packed snow. This increased effort seems to make up for the fact that our snow shoe hikes are so much shorter than our trail hikes, and it also makes the gray, high 20 degree weather just a little more enjoyable. As usual, we started off prior to lunch, then hiked to a good spot with a view to sit and have a bite, then continue on. All told, it was likely a 4 mile hike. Don’t really know how long it took, as long as we time it to be back well before dark, the time isn’t that important. This entry was posted in Bicycling & Fitness on December 30, 2007 by golinielcomblog. Friday was a fun day. We arrived in the dark a little after 7:00 am to watch the preparations. While we waited we had a nice chat with Multnomah County Commissioner, Maria Rojo de Steffy who discussed some of the issues involving the need for, and construction of, this new bridge. Finally about 8:30, after getting the ok from the insurance, and safety officials, the new arch was pushed out into the channel. They did a quick 90 left turn in order to face down river and then set off at a surprisingly fast pace for such a large and heavy object. We raced up highway 30 in hopes of watching the arch float under the St. Johns bridge, but a traffic accident allowed the arch to beat us to the spot, so we continued on up to Sauvie Island. All the parking in the center of the exit ramp directly off the bridge has been taken over by construction equipment all summer long, but there is parking north of the store so its just a short little walk back up to the dike, for prime bridge installation viewing. It wasn’t more than just a few minutes before the arch arrived, stopping in the middle of the channel to be turned 90 degrees once so that it would be parallel with the bridge. Then it was pushed into a position that will allow all the final prep work can be done prior to final installment. That is expected to take Saturday and Sunday. Don’t get too excited, the bridge doesn’t open until Summer of 2008. This entry was posted in Spanning the Bridges on December 29, 2007 by golinielcomblog. 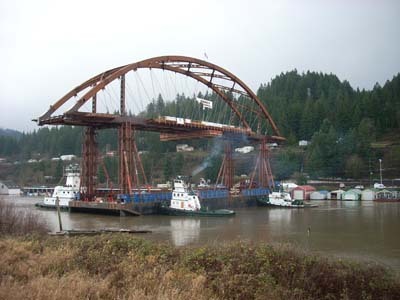 New Sauvie island Bridge Span waits to be moved. We stopped by the bridge to see it again today. It is jacked up about 50 feet on the barge, and it will soon float down the Willamette and then be dropped into place. Apparently there will be 15 feet of clearance under the Freemont bridge. That should be interesting to see. 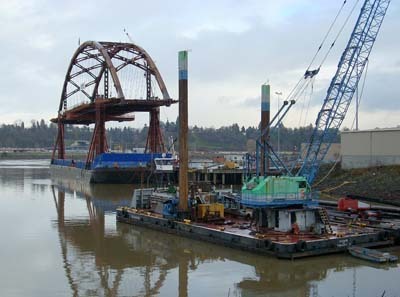 I called the number for schedule update (503-988-4884) and the message there said the bridge would be moved on Friday. The Oregonian has originally said Thursday. So we will check again in the morning for current updates. 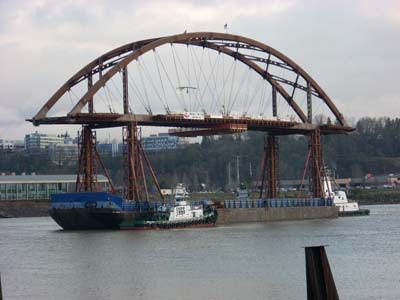 Thursday, Dec 27th – The barge carrying the arch is set to leave terminal 2 between 7:00 am and 9:00 am Friday December 28th and take about three hours to reach the installation point. 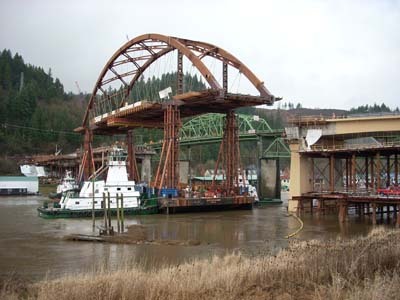 This entry was posted in Spanning the Bridges on December 26, 2007 by golinielcomblog. Danish Christmas traditions are mostly about food. Christmas in a family that values their Danish heritage is a holiday full of wonderful food and tradition. A very significant traditions is the RisengrÃ¸d or rice pudding. At our home, as well as our grandmothers, it could be served warm, or cold, with milk, or whipped cream, cinnamon, and/or butter. And always with one whole almond mixed somewhere in the large serving bowl. And tradition calls for the one who finds the almond also gets a small gift or prize. In the olden days this porridge was placed on the farm lofts with a mug of Christmas beer to please the pixies. If the pixies were happy with the food and brew the farm would be in luck for the following year. Somehow, for some reason, I don’t remember getting any beer with our pudding. Anyway, during this holiday season, I was pleased to see that the pudding was also served at our churches holiday evening. It was good to see that the tradition is followed by others as well, even though I didnt get the almond, or beer that night either. The crumbs can be from dried bread, cake zwieback, macaroons or a combination. Brown the crumbs well in a skillet with butter and 1 tablespoon sugar. Put a generous third of the crumbs on the bottom of a serving dish. Layer 1/2 of the applesauce. Grandma made this with freshly cooked applesauce, but store bought is ok. Put in another layer of crumbs leaving a sprinkling for the top. Layer in the other 1/2 of the applesauce. Chill in refrigerator and allow to harden. Serve cold with generous topping of whipped cream that includes the vanilla and teaspoon sugar. You can sweeten/decorate with brown sugar or red jam if you wish. This entry was posted in Social on December 24, 2007 by golinielcomblog. Oregon Share the Road License Plates out Jan 2nd! Oregons new “Share the Road” auto plates designed to promote and protect bike riders and pedestrians will be released in January 2008. Write â€˜I want the Share The Road plateâ€™ on your renewal notice and send it in with an additional $10 above your regular renewal fee. If youâ€™re between renewals, you can order the plate anytime after January 2 online at OregonDMV.com or through a DMV office, for a $15 replacement plate fee plus the additional $10. Here at GoLiNiel, we will be ordering our plates for both cars the first week in January. No need to wait around for the plates to expire. Note to Family members: GoLiNiel can pay the initial registration fees for any family member who would like one of these plates. This entry was posted in Bicycling & Fitness, Portland, Or, Oregon on December 21, 2007 by golinielcomblog. What flat panel monitor should I buy for my pc? My sister writes: I am contemplating getting a flat monitor for my computer. Did some looking on line, but found that it’s hard to tell about picture quality etc when I’m not in person. I don’t have to have anything fancy or very big, but I would like something more sleek than the mini-truck now on my desk. What advice might you have on brands, stores, or all those fancy numbers that they use to describe their machines? OK sis, this is a big territory, so here is more than you probably wanted to know…….. It is important to be able to adjust the placement and angles of the monitor since you may be looking at the monitor for extended periods of time. Most monitors can be tilted and I would not recommend one that did not tilt. Some of the best can also pivot. A cool feature but unless you cannot move the monitor base, not a necessary one. A real nice feature to look for when choosing a monitor, is if the monitor can be raised or lowered, since monitor height is perhaps more important than monitor angle. As in TVs, size is the diagonal measurement of the screen. Generally speaking, monitor sizes will be 17 inch, 19 inch, 20 inch and 22 inch. Prices will typically increase with size. Also, with each increase in screen size, text is easier to read and there is more desktop space in which to move and display concurrent applications. So maybe a valid selection criteria could be, how much do you want to spend. It is not necessarily true that increases in size correlates to increases in resolution and picture quality. Some monitors will come with extra features, that are simply a matter of preference. Integrated speakers may save space if you don’t want speakers elsewhere. But integrated speakers may not be as good as ones you already have, or plan to get. Headphone jacks and USB ports could be nice if your pc unit is not placed conveniently. So don’t pay extra for features you already have in your pc. Adjustment and power buttons are perhaps the most significant extra features decision. You might want to make a decision and the look and usability of the buttons, particularly the adjustment buttons. Yet the functionality of the power/menu buttons are going to be the so similar for most all models that differences in button design are inconsequential. Support can be important if there are issues with the performance of your monitor. While most all major brands will have an adequate or comparable support process, some off brands may not. Contrast Ratio is a way of measuring dynamic range, expressed as a ratio. The ratio is found by comparing the brightness at the screen center when all the pixels are white to when the pixels are black. The contrast ratio is a good indicator as to how rich the colors will appear, generally the higher the number the better the image. You know, whites whiter, blacks blacker. An average contrast ratio would be 500:1 This is a technical measurement of a visual display, therefore a bigger number isn’t necessarily better. The better measurement is still what looks good to you. Response Time is usually measured as the time it takes to change a pixel color from fully black to fully white, others measure gray-to-gray (color to another color). This is delineated in milliseconds. Milliseconds? Seriously, who cares? Lets just disregard response time. The time is takes for your computer to respond is an issue, not so critical for your monitor. Brightness is measured in candelas per square meter, and again it is more technical than user relevant. Most comparable monitors will be rated the same. You should base your opinions of visual quality on your perceived standards anyway, so lets just disregard the brightness specifications. Aspect ratio refers to size. In this case it refers to the screen dimensional measurements in number of units. For example: the 16:9 ratio refers to 16 units wide by 9 units high. It would be wider than taller. A 4:3 aspect ration would be 4 units wide and 3 units high. Still wider than higher but almost square. The 4:3 and the 16:9 are the two main aspect ratios available. The 4:3 ratio is more typical for pc applications. Most monitors of 22″ or larger will use the 16:9 ratio which may tend to require more scrolling up and down pages in order to see all of the display of a page. Resolution is expressed in terms of the number of pixels on the horizontal axis and the number on the vertical axis. The sharpness of the image on a display depends on the resolution and the size of the monitor. The same pixel resolution will be sharper on a smaller monitor and gradually lose sharpness on larger monitors because the same number of pixels are being spread out over a larger number of inches. If enough attention is given, you may be able to tell a difference in resolution. This specification is of little importance with text applications, but gains more importance with more detailed graphic ones. Again, the higher the number may not be as important as your personal judgment of the picture quality. A Kensington Security Slot is a small hole used for attaching a lock, in particular those from Kensington Computer Products Group. Locks are generally secured in place with a key and attached through cable to be looped around a permanent object, thus securing it in place. Kensington locks aren’t designed to be a solid protection measure as the lock can be torn out. The Kensington lock is best used in busy offices, coffee shops and libraries, as it is often used as a deterrent to prevent opportunist theft. In a home, it is not of much value for protection against theft of a monitor, so the choice is yours. HP, NEC, ViewSonic, Syncmaster, Dell, LG, Samsung are among some of the most dependable monitors which are in a similar class. Most big box stores, and computer and office supply stores will sell some of these brands. My recommendation is that you make buying decisions based on more on price (your price range, price differences between stores, sales prices, etc), functionalities and personal visual comparisons than on technical specifications. Go to a store that has several makes, models and sizes side by side, showing the same display. Which one do you like the best? Look more at the big picture (bad pun?) , and remember that the technical specs are just the tiny details. This entry was posted in Tivos & Other Technology on December 18, 2007 by golinielcomblog. Many simple tools for biking vs a single unit? We like to ride our bikes a lot. And when we ride we have a need for a lot of input. That input helps fufill our needs of safety, planning, fitness and my compulsive need of data collection. Take a look mirrors are a small square mirror that fits on the glasses. Essential for monitoring traffic and what is going on behine you without taking your attention away from what is going on in front of you. Polar heart rate monitors keep us informed on our levels of exertion and fitness. 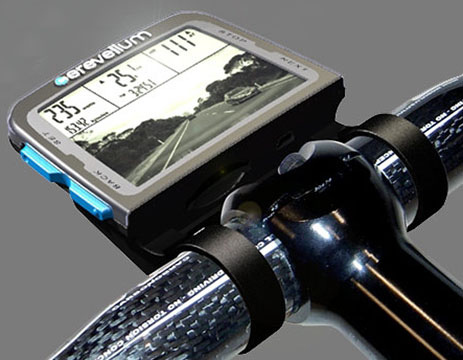 Any simple cyclometer for data such as mileage, speed, times, etc. Honey likes the ones from Planet Bike. The larger display is easy to read in low light conditions, the “no buttons” design is easy to use. Plus it has a thermometer, which she delights in calling out on those days that may be bitterly cold, or blazing hot. The Shimano STI shifters are simple, dependable and easy to use. But you still have to look back down to the chain rings to verify positioning, especially if you shift as much as I do. We carry handlebar bags, for many gadgets like phone, camera, bars, etc. These bags also have a clear plastic pouch Honey likes to use for a map. She prefers to have clear and accurate data available to her about where she is and where she is going. I have developed a simpler and cheaper solution. A paper binder clip you can find on just about anyones desk, secured to the handlebar stem with a plastic zip tie, is a cheap, durable and dependable map holder. Alright, these are all good things. Fairly cheap and simple. GPS mapping – to map out any course, and allow me to wander aimleslly, while Honey keeps track of where we are. Flight Deck shifting integration – to electronically shift and display gearing, without having to look behind you to confirm gearing. Hear rate monitor to track fitness and exertion levels. This thing basically has all our input/output needs covered in one handy little unit! This entry was posted in Bicycling & Fitness on December 18, 2007 by golinielcomblog. Another Danish bike safety implemtation U.S. will never see. Treehugger has a post on RFID Lights Up The Blind Spot . Basically, a sensor can be placed in a bike, so that when a cyclist approaches the intersection, the RFID sends a signal to the traffic light which turns on a flashing ‘cyclist’ sign at eye height to warn drivers, especially drivers of big rigs, that they should check for bikes before making a right-hand turn. Hmmmm, does that just make too much sense, or do we just not care? This entry was posted in Bicycling & Fitness on December 17, 2007 by golinielcomblog. Here is a sweet potato recipe Honey uses a lot during the holidays. It is great for taking to dinner parties and potlucks and always brings compliments and recipe requests. Boil gently in a covered saucepan for 20-30 minutes, until easily pierced. Drain, cool slightly, peel, and set aside. Add onions and saute until tender and translucent, about 6-7 minutes. Thinly slice the sweet potatoes 1/8 to 1/4 inch thick. Arrange half of the sliced potatos in the 1 1/2-quart baking dish. Sprinkle with half the thyme and half of the onions. Cover with half the sliced apples, then sprinkle with half the brown sugar, and dot with half the remaining butter. Cover dish with foil, and cook for 30 minutes. Uncover and back for about an hour more, or until apples are soft, casserole is bubbly and center is hot. It is best served hot, and can be rewarmed in microwave. This entry was posted in Bicycling & Fitness on December 15, 2007 by golinielcomblog. Klineline Bridge linking Highway 99 over Salmon Creek has been closed, and will remain unusable for more than a year while a new bridge is built. Clark County Public Works announced the closure Thursday after engineers concluded that recent high waters damaged the piers enough that the bridge could collapse. “We can’t rule that out as a possibility,” said Jim Gladson, spokesman for the public works department. One way the bridge could fail would be that the structure shifts, causing the pavement to lift. “The other is the bridge ends up in the creek,” he said. 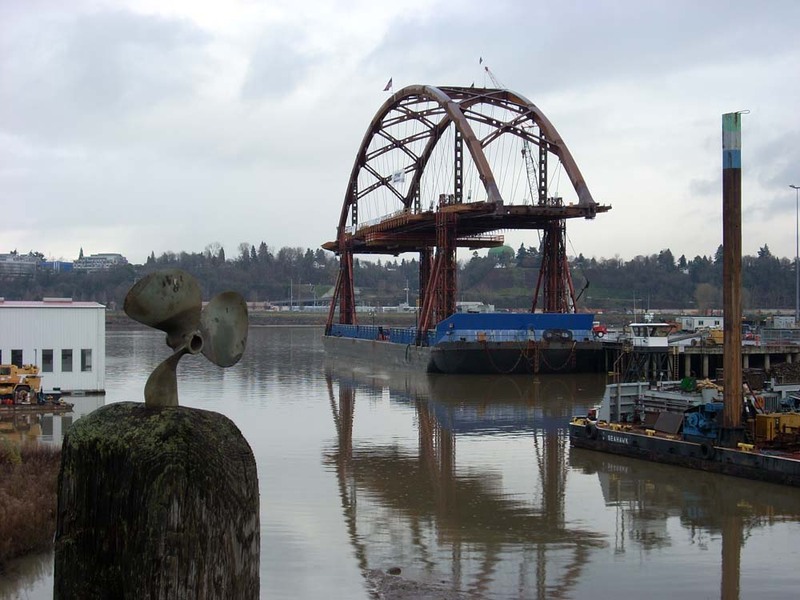 The bridge will be closed to motorized vehicles, pedestrians and bicyclists. 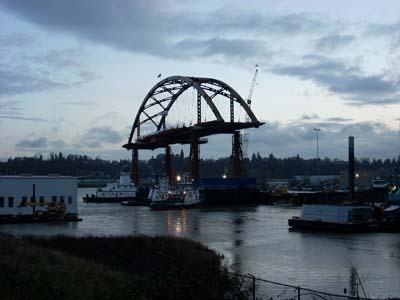 Construction on a replacement bridge is scheduled to begin in April and take up to a year. Cost is estimated at $7 million. 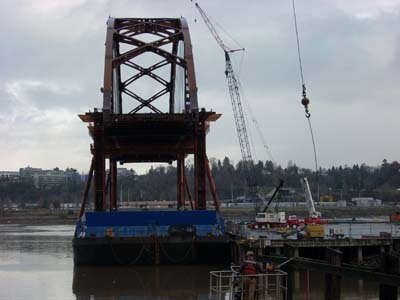 The existing bridge was built in 1927, when engineers could not design long spans and so piers were placed in the creek to support the bridge.Â In 1949, a pier was undermined and one end of the bridge dropped several feet. In 1956, water eroded the central pier and the middle of the bridge collapsed. This entry was posted in Spanning the Bridges on December 13, 2007 by golinielcomblog. Sundays Christmas holidays activity was a ride on the Holiday Express Steam engine. The train departs from a spot directly on the Springwater trail, next to Oaks Park. The skies were a dark grey, it was 39 degrees, and it was snowing, and sensible people might think it is not the best bicycle riding opportunity. But it seemed like a good idea to us. So, with several layers of clothes and some good lights we set off for the bike ride through Sellwood, and out the Springwater trail to board the train. 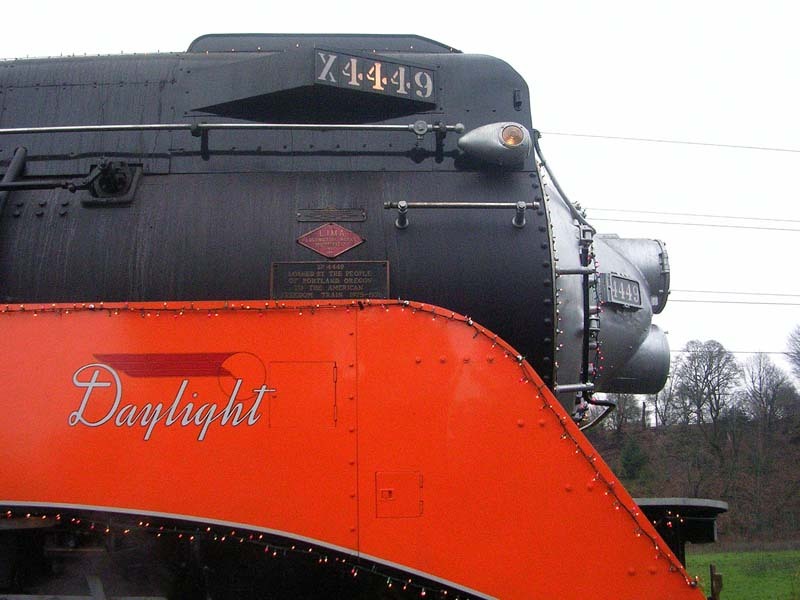 The Oregon Rail Heritage Foundation (ORHF) will be holding its annual fundraiser, the Holiday Express on December 7th – 9th & 14 – 16th on the Oregon Pacific Railroad. The 40-minute round trip train ride departs from Oaks Park Station, follows the Willamette River north towards the Ross Island Bridge and back. So its a very short, and slow trip, (bicycles were passing us) but the views of the river are very nice. 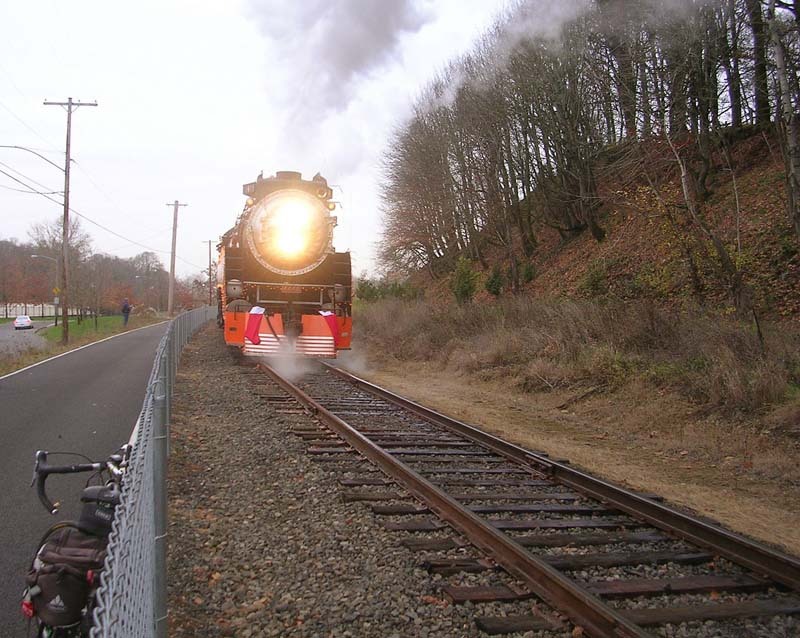 Oregon Rail Heritage Foundation’s mission is to build a new home for Portland’s three steam locomotives. 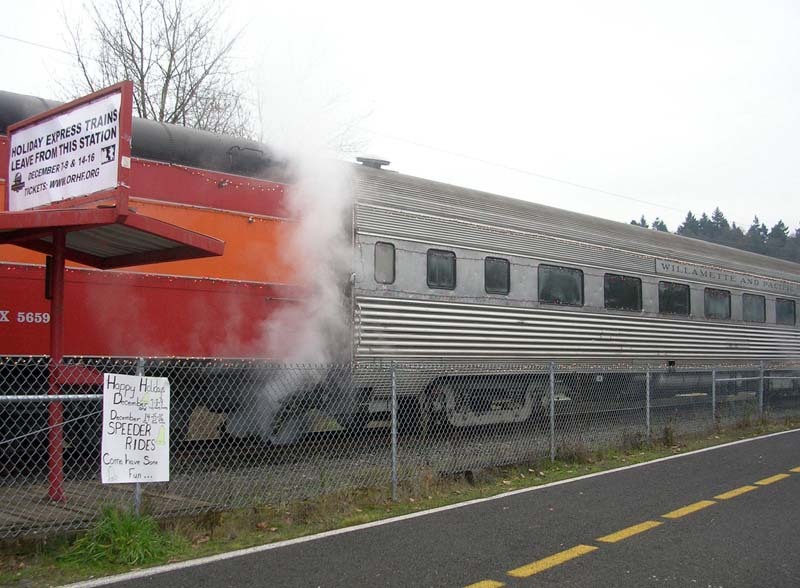 ORHF is currently negotiating the purchase of property near the Oregon Museum of Science & Industry, because it is within city limits, next to two railroad lines, and an ideal place for the steam locomotives to be accessible to the general public. It was a fun outing to include in our holiday activities, and it seems like a good cause to support. 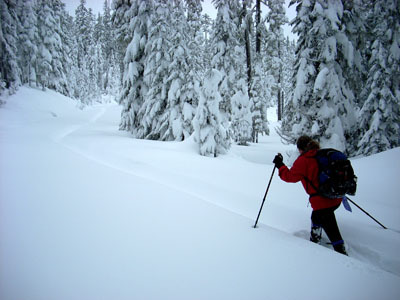 This entry was posted in Portland, Or, Oregon on December 9, 2007 by golinielcomblog. We want to update you on the work we’ve been doing this fall with the Portland Police. In the wake of several tragic, high profile bike crashes many people in the region were frustrated with the police response, concerned about their rights on the road, and feeling helpless to ensure their own safety in such an uncertain enforcement environment. We’ve begun a dialogue with Portland Police Chief Rosie Sizer and Traffic Division Commander Vince Jarmer and they have expressed a willingness to work with us and to work on their enforcement and communication practices around bike crashes. A Community Policing Agreement that will outline agreed enforcement practices. This agreement will be developed with participation from the cycling community, PDOT, the Police Bureau, the District Attorney’s office, and the City Council. Enforcement actions at high-crash locations. Monthly reports on citations and investigations from the police bureau. Change to the policy on when an investigation is conducted and a citation issued. We want the city to allocate more resources to the Traffic Division to allow them to investigate all crashes involving vulnerable roadway users. Reduction in delays to investigations caused by the State Police Crime Lab. Further, the police will notify us when investigations are complete and reports are available for review. Education of officers on the unique vulnerability and safety issues regularly faced by cyclists. Establishment of a bicycle liaison in the traffic division. Sting operations with undercover officers or volunteers on bikes to catch motorists engaged in road rage behavior. Better training for officers on how to communicate to the media after a bike crash. We are pleased that the Portland Police Bureau is willing to examine and evolve their own internal processes as Portland becomes a more bicycle-friendly city, and we will be working with them on these issues intensively over the next few months. In addition to the above, we are working with folks from around the State to strengthen sentencing laws and facilitate citizen initiated citations. If you have thoughts or concerns, please let us know. Thanks to all BTA members – this kind of long-term advocacy can make big positive change, but it takes time and planning and cooperation. Your support is what makes it possible. This entry was posted in Bicycling & Fitness, Portland, Or, Oregon on December 7, 2007 by golinielcomblog.